Explanation: This remarkable scene combines multiple exposures recorded on the evening of January 18th from a waterside perspective in Hong Kong, China. It follows a young crescent Moon, with brilliant planet Jupiter to its left, as they set together in the western sky. Their two luminous trails are faintly paralleled by trails of background stars. 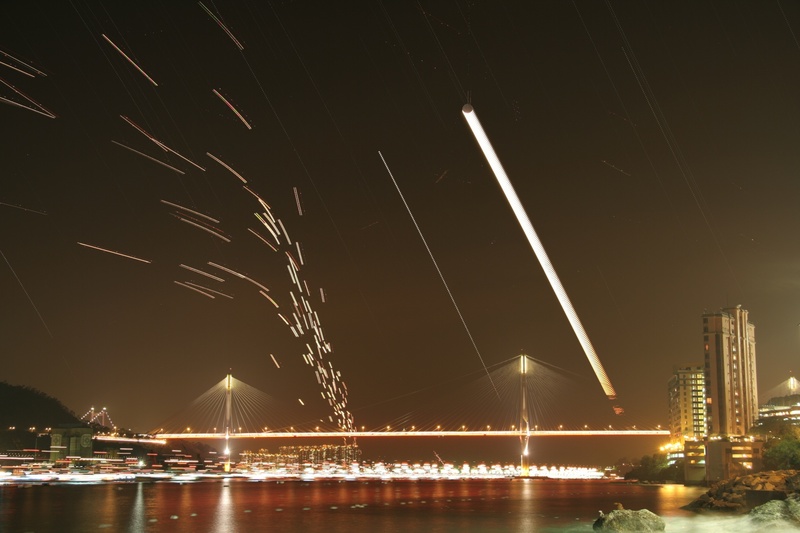 But easier to pick out are the short, bright airplane trails converging toward the horizon and the Hong Kong International Airport that seem to offer a frenzied imitation of the celestial tracks. Of course, the reflection of city lights and boat traffic follows the water's surface. Streaking car lights define the span of the cable-stayed Ting Kau bridge.